The fungus Aspergillus flavus can infect several crops, including corn. Some varieties, or strains, of A. flavus produce aflatoxins. Aflatoxin contamination costs U.S. farmers billions of dollars every year. Worse, aflatoxins are harmful for humans and animals. To reduce aflatoxin contamination of crops, farmers use safe commercial strains of A. flavus. These biocontrol strains do not produce aflatoxins. When applied to crops, the biocontrol strains outcompete the harmful aflatoxin-producing fungi. That reliably reduces levels of aflatoxins in the harvest, transport, and storage stages. However, commercial strains may not be the only answer. A new study shows that using safe, native strains of A. flavus can be as effective, or even more effective, than commercial strains. "Using native A. flavus strains could have many advantages," says Ignazio Carbone, lead author of the new study. "Native strains may be better adapted to the soil type and weather conditions. Therefore, they may perform better in the field compared to non-native strains." Carbone is a researcher at North Carolina State University. Moreover, using commercial strains can have some disadvantages. They usually need to be reapplied each year, at a cost of $20 per acre. Also, the application has to be done aerially or manually. "That can deter farmers from using commercial strains," Carbone explains. Native strains, on the other hand, occur naturally in growing areas. They may be more persistent in the soil and not need to be reapplied every year. Carbone and colleagues tested native strains of A. flavus that produce no or low levels of aflatoxin. They also tested commercial strains. Both reduced crop aflatoxin levels. Corn for human consumption can have maximum aflatoxin levels of 20 parts per billion, per FDA regulation. Untreated crops had aflatoxin levels above 35 parts per billion. 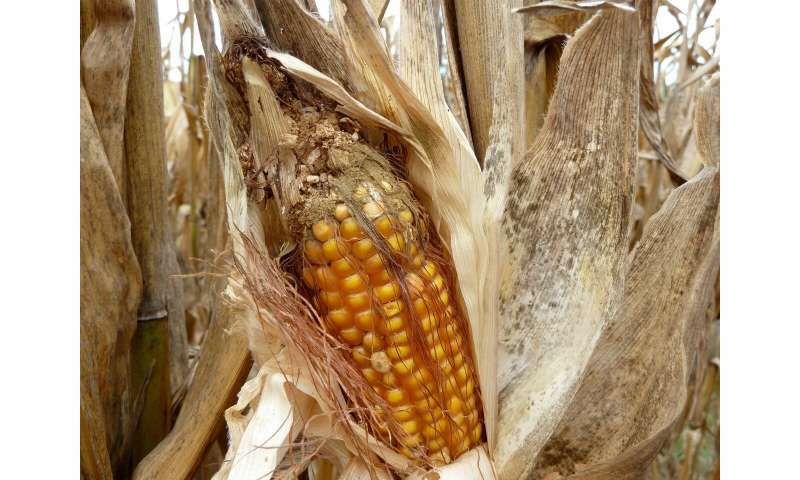 Native and commercial strains reduced aflatoxin levels to lower than 10 parts per billion. Unexpectedly, the study also showed that certain combinations of native strains are more effective than commercial strains in reducing aflatoxin levels. That's because the combinations take advantage of fungal biology: their mating types are compatible, allowing them to reproduce and sustain their population. When the researchers applied native strains of compatible mating types to the test plots, aflatoxin levels were reduced to less than 2 parts per billion in some cases. This was a better outcome than any commercial strain. "Our results suggest that using native strains could lead to sustained reductions of aflatoxin levels. Using native strains could be very cost-effective for farmers over the long term," says Carbone. Although this study was conducted in North Carolina, Carbone anticipates the approach can work in other areas. A preliminary experiment in Texas also showed that paired native strains reduced aflatoxin levels more efficiently compared to a single commercial strain. "We need to continue testing this approach in cornfields across different states," says Carbone. "We also need to monitor aflatoxin levels over several growing seasons." Future field trials may include testing current commercial strains plus a compatible mating partner strain. Different combinations of native strains may also be tested, says Carbone. Can this approach go beyond aflatoxin? Carbone is optimistic. "Fungal toxins pose a continual threat to food safety. Our approach can potentially be applied to other toxin-producing fungi as well."